Aren't they pretty? And they taste good, too! This is my final post as part of The Republic of Tea's TEAm, and I have to say it was an interesting experience. I tried (and learned about) more varieties of tea than I would have ever sampled under other circumstances. Some I might (maybe, eventually) have tried on my own, while others were at the edge of my normal tea-drinking comfort zone. I found some new teas to drink, and some others, like matcha, that I'll be incorporating into recipes. And I learned a lot about steeping temperatures and times, although it's way too much to remember. I'll just read the packages. And I've got enough tea and tea-related gadgets to keep me steeped in tea for a long time. And I've started drinking tea more often. I might have a caffeinated tea mid-morning or an iced tea in the middle of the day. At the end of the day, an herbal tea, hot or cold, often keeps me company as I wind down. Although I'm saying that this is my final post for the TEAm, it's not actually a required post. I already fulfilled my commitment with them, and I really didn't need to write any more. BUT, since they give a discount code for my readers each month, I thought it was worth writing one more post, just so you can take advantage of the discount, if you're interested. And just because I'm done with the commitment, it doesn't mean I'm necessarily done writing about tea. In a few cases, I didn't have enough time to work out any recipes with the tea in time to write a post before the discount expired. And I really wanted to pass that discount along. I've already made one recipe with hibiscus tea, and I've got ideas for a few others - cocktail infusions, baking recipes, and other oddities. I'll get to those later. This month I got the Harvest of the Seasons collection, which is four tins of loose tea including a winter tea that features citrus, a spring tea with fig and rose, a fall tea with apple and almond, and a summer tea with lime and strawberry. I have to say that this was, without a doubt, the prettiest presentation. 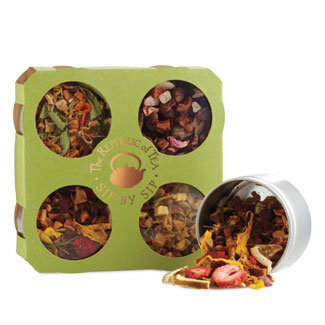 The tins all have clear tops, so you can see the teas, which makes this a really great gift item. And of course the tins are reusable, so when the tea is gone, you can fill them with more tea. Or paperclips. Or whatever. And now for your goodies! If you purchase one Harvest of the Season Gift Set from The Republic of Tea between now and August 10, 2013 you will receive one complimentary People’s Stainless Steel Brew Basket (limit one per customer). The Republic of Tea is also launching a line of Cuppa Cake Teas and a refreshing Hibiscus Watermelon Superflower Tea this month. The Cuppa Cake Tea collection is comprised of three calorie-free, gluten-free teas (Blueberry Bundt Tea, Lemon Chiffon Tea and Caramel Vanilla Tea) with flavors inspired by delectable cake recipes from the local bakeshop. The caffeine-free Hibiscus Watermelon Superflower Tea (available in late August) offers sweet-tart premium Nigerian hibiscus blossoms combined with the cool taste of ripe watermelon to infuse a well-balanced flavor reminiscent of berry and bright citrus. A donation of $1 from the sale of each tin will also be donated to Action Against Hunger, a global nonprofit working to end hunger. Thanks to The Republic of Tea for sponsoring me as part of the TEAm!